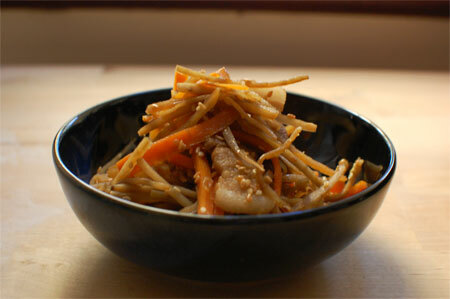 Kinpira gobo, sweet soy glazed burdock root, is one of my favorite Japanese home-style food. Kinpira is a Japanese cooking style of “sauté and simmer”. It is commonly used to cook roots vegetables such as burdock roots, carrots, lotus roots and bamboo shoots. 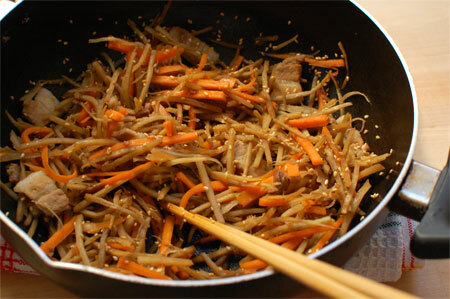 The common ingredients for kinpira gobo are shredded burdock roots, carrots, and meat (usually thinly sliced pork or beef). The seasonings are typical 4 Japanese ingredients. 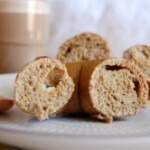 If you have these 4 ingredients in your kitchen pantry, you can make kinpira at any time. 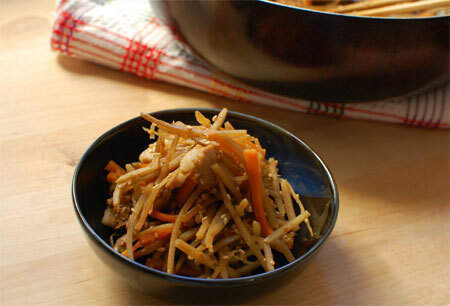 This time I used frozen shredded Japanese burdock roots. There are also frozen shredded burdock roots from China at grocery shops and are much cheaper, but Japanese one tastes much better. Even after thawed, the each burdock root still remains its crunchy texture. It’s bit hard to get fresh burdock roots in Perth, so I always buy a frozen packet from Asian grocery shop and keep in the freezer. Peel the carrot and shred into the same size as burdock roots. Heat sesame oil in a frying pan, and saute burdock roots and carrot for 2~3 minutes. Add sake, mirin and soy sauce to the pan. Stir and cook until the liquid is almost gone. Turn off the heat and mix through the sesame seeds. You will need burdock roots for kinpira. 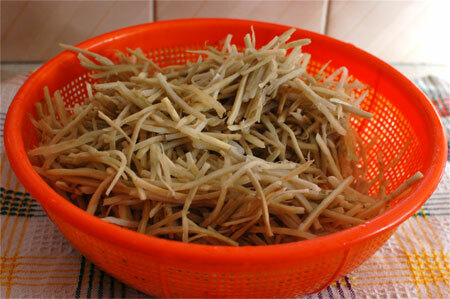 I’ve never seen fresh burdock roots in Perth, so I buy frozen one from Yee Seng Oriental – my local Asian grocery shop. I’m sure you will find it at Nippon Food in Subiaco, Lion Oriental / Loi’s / Emma’s Seafood Young Tofu in Northbridge, and other Asian grocery shops across Perth. They are frozen, usually shredded. The name may be “gobou” or “gobo” (Japanese for burdock roots). Thanks so much! 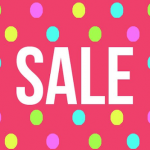 Im going to check out Lion and Emma’s today! 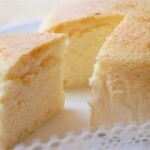 I think Nippon Food has lot more variety in Japanese food. 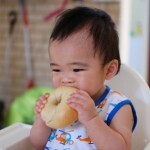 However, because of tsunami and radiation that happened in Japan, lots of things are prohibited to import from Japan. I notice many Japanese instant noodles available in Nippon Food – I think they are easy to get approved to import. I’m not sure if they sell konnyaku noodle but give them a try 🙂 Hope you find something you are looking for!